With a stylish and modern toneontone scrolling leaf design, this beautiful curtain panel will give your window instant designer appeal. 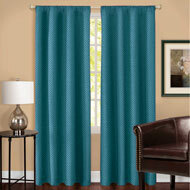 Each curtain panel has grommets at the top for easy hanging. Available in two lengths. Machine wash. Panels sold individually. Polyester; imported. Colors available in Chocolate or Burgundy. Sizes available in 54" x 63" or 54" x 84". Roomdarkening panel is available in 7 beautiful colors to complement any décor. 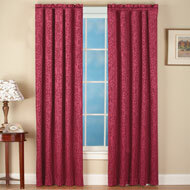 Energysaving curtain helps cut down utility bills by blocking out heat, cold and even reduces outside noise. Grommets at the top make hanging easy. 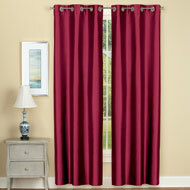 Available in 2 lengths; 63" or 84". Panels sold individually. Machine wash. Polyester; imported. Colors available in Burgundy, Navy, Turquoise, Taupe, Red, Spice, or Purple. Sizes available in 53"W x 63"L or 53"W x 84"L.
Add beautiful style & energy efficiency to your windows with these lovely faux silk panels. 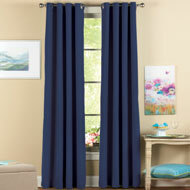 The foambacked, black out panels help keep rooms warmer in the winter and cooler in the summer. Metal grommets at the top make hanging easy. Machine wash. Polyester; imported. Set of 2. Color available in Blue, Burgundy, Beige or Chocolate. Size available in 63"L x 37"W each or 84"L x 37"W each. 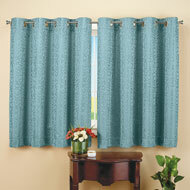 The classic style of these beautiful curtains is a perfect addition to your traditional decor. 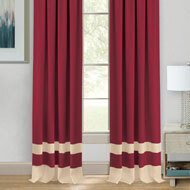 They feature a solid color accented with a stripe at the bottom. Available in 5 colors.  Panels are available in 2 lengths. Rod pocket top for easy hanging. Panels are sold individually. Machine wash. Polyester; imported. Colors available in Burgundy, Black, Beige, Grey, Green, or Navy. 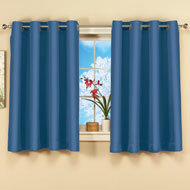 Panel sizes available in 52"W x 63"L or 52"W x 84"L.
Thermalbacked curtains provide insulation from heat and cold, block light, reduce outside noise and feature a beautiful scrolled design. 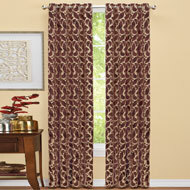 Panels feature an allover scroll pattern with an elegant sheen and are sold individually. 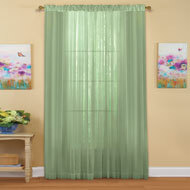 Each panel has a rod pocket top for easy hanging. Machine wash. Polyester. Colors available in Taupe, Blue, Chocolate, Sage, Burgundy or Lavender. Sizes available in 63" (50" x 63"), or 84" (50" x 84").